That’s usually the reaction I’d get if I mentioned Durian to anyone I know. OMG, GET THAT AWAY FROM ME, YOU SICKO!! I absolutely fall into the first category. I love Durians! Cooked, steamed, raw, sweet and savoury. If you’ve got it, I’ll have it. Some describe its wonderful creamy flesh with love and a dazed lounging in their eyes. Others with intense disgusts call it worst than stinky cheese. Heck, famous Anthony Bourdain (who loves Durian) has mentioned how indescribable it is and has been quoted as saying, “Your breath will smell as if you’d been French-kissing your dead grandmother”. Whether you love it or hate it, it’s undeniable that the humble King of Fruits (in South East Asia) is a great topic of conversation. Durians are aptly named. It derives its name from the Malay word duri (thorns) and is very prickly to touch. Durian sellers tend to wear thick gardening gloves when showing off their bountiful harvests to customers. 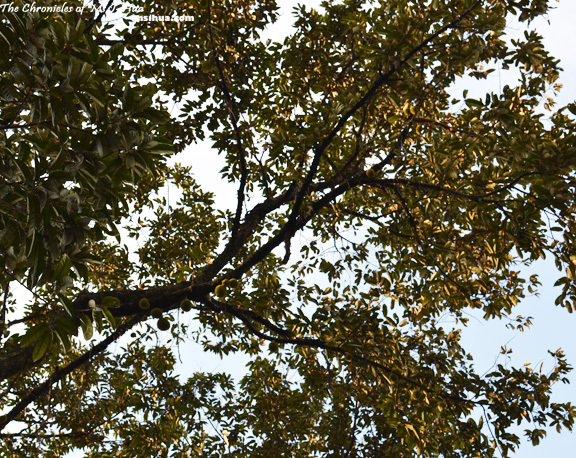 Durians come from big tall trees which flower at the most twice a year. Durians are heavy and can weigh anywhere from 1-3kgs. 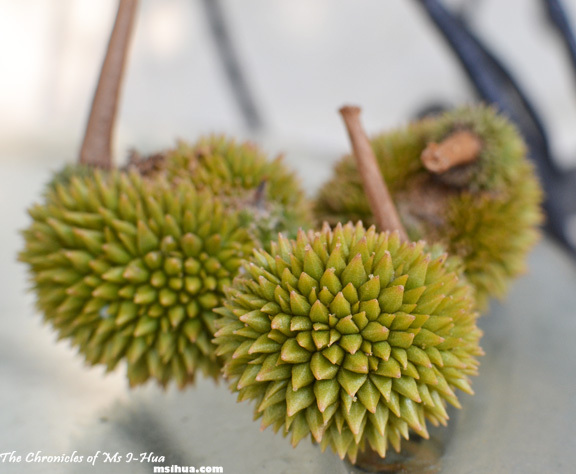 So you definitely don’t want to be near a Durian tree when it is ripening! They make quite the noise when the fruits fall to the ground. 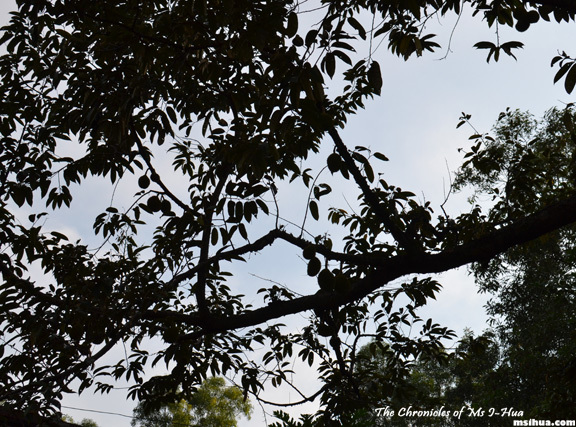 In Malaysia, the Boy’s garden includes a huge Durian tree (pictured above and below) which decided to start flowering and providing the family with its fruits after 15 years. Lucky him! Can you spot the durians? The first two pictures at the start of the post shows baby Durians (which we’d picked from the ground around the tree) which have unfortunately fallen to the ground before fully maturing due to a storm. In Melbourne, we aren’t so lucky as to be able to buy fresh Durians from any corner of the road or at the supermarket. Most of the Durians available for consumption in Australia are mostly frozen and sourced from South East Asian countries as it is a tropical fruit. Although, there are Durians being grown in Queensland and NT but I’ve yet to encounter them in Melbourne. 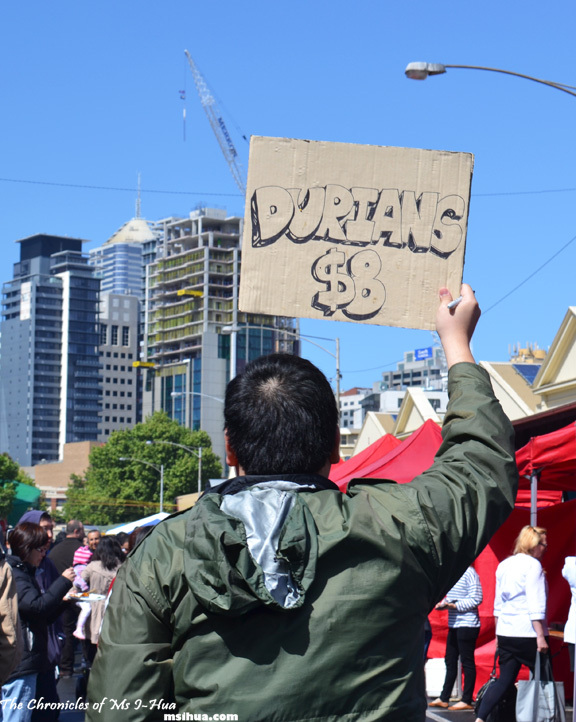 In the recent Malaysian Street Food Festival held at Victoria Market, a gentleman was selling Durians and he was crying out a catchphrase, which is where I’ll end this post with. 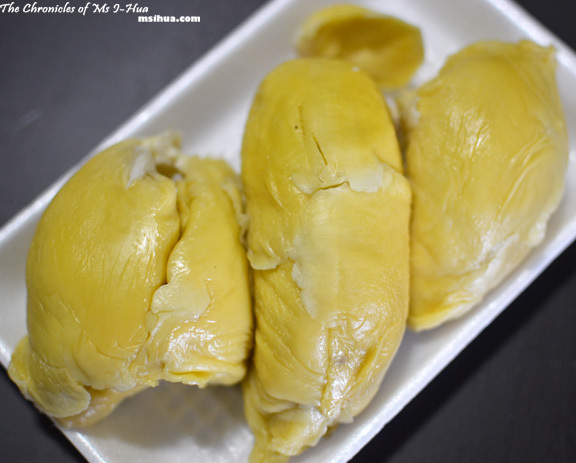 So tell me, my dear readers, do you like Durians? What do you liken their taste and smell to? durians in qld? well i havent seen any and i guess i havent given up the habit since coming to australia although im pretty sure i will try to get my hands on some when im back in msia. Oh how cute! 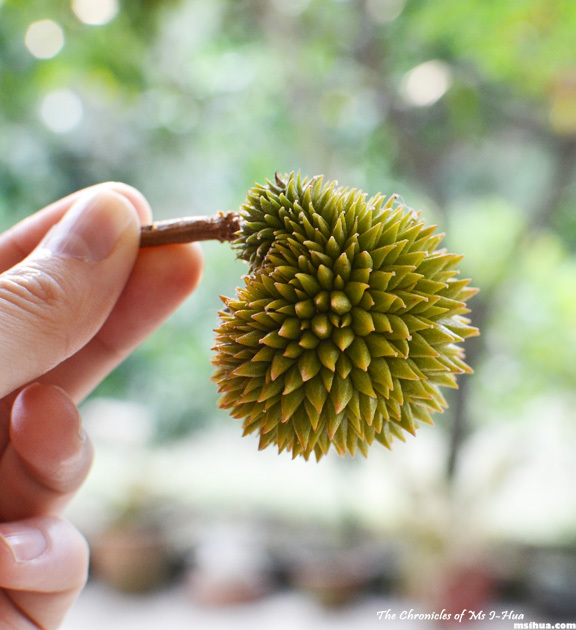 A baby durian… I want I want…love Durians. I am such a durian head.. will eat till I get sick..
And then finish of with mangosteens!!! OMG, I’VE WANTED TO TRY DURIAN FOR YEARS BUT HAVEN’T HAD THE CHANCE!!! Can we make a durian blue cheese cheesecake with a side of liver? Why not? I bet Zumbo could do it. The fruit that I detest the most…. so unAsian right? I cannot stand the smell nor the taste. My parents are lovers of durian though. High fives!!! What stinky smell? Its pleasant to my senses 😛 Yeah it’s a baby durian which fell off the tree! I don’t like to eat durian but i love to eat durian candy! I just want the taste but yo smell it, It’s really hard for me. My body and soul can’t resist the stinky smell of it but really love the Durian Candy..
I’ve never eaten them :/ I’ll give anything a go though! I’m in the ‘EWWWWWWW’ category 😛 Although your pictures of the little ones make them look very cute! And lols at Anthony Bourdain’s quote!! Ashley recently posted…Komeyui Omakase – A dialogue from Bryan and I! WHAT? YOU TOO! Lol… Et tu! hahaha.. I’m way too lazy to do anything with them other than eat them fresh!! Heehehehe… just eat them straight! That’s the best! I agree only with the first part of his statement. I love durian. The smellier the better. The whiffiness is mouth watering! Nooo! How can we be friends? Lol… I love the durian gelato at Freddo… been going for years.. they have durian in most places now.. Glen Waverley and Box Hill! I LOVEEE Durian!!! Wild, fresh, in desserts, anything! I’m gonna make as much Durian desserts as I can when I get my hands on some when I’m home this summer to fulfil my craving hehe.. Btw I’m really diggin the dessert options they have here. You always have so many interesting options for eateries that I have never even heard of! Nice! Oh how cute is that mini durian?? Everyone will always love babies 🙂 Baby anything really! The guy that selling Durian is right “don’t smell it just taste it”. Although it really smell bad but taste is definitely yummy. Durian is very popular in one of the province in the Philippines. Since i tasted Durian ice cream I start loving the taste of it.For me the smell is not that bad. Hahaha.. that is very true!